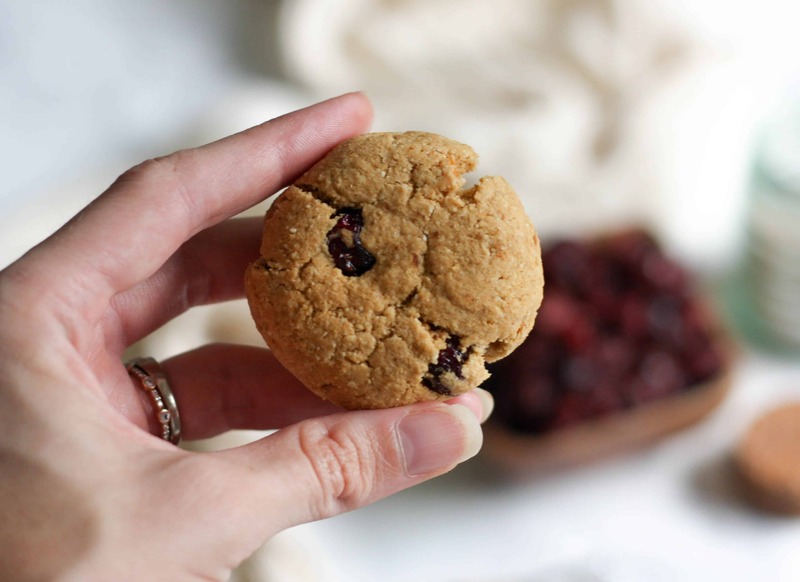 Autoimmune Protocol (AIP) friendly recipe makes absolutely delicious egg free and nut free Cranberry Orange Cookies! No one will guess that they’re gluten-free, grain-free, and Paleo friendly. Holiday flavor all in one fluffy cookie. Grab the recipe below. It may only be October, but with a baby due around the holidays, I have all things cranberry on the mind! These cookies are full of holiday flavors, but honestly I’d eat them year round. 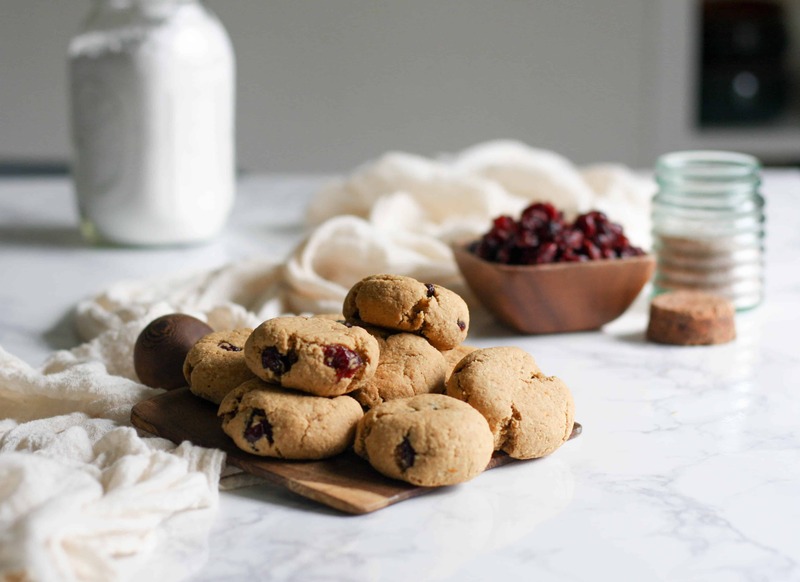 This recipe was originally adapted from my Cranberry Grapefruit Cookies. Turns out I’m not the only one craving cranberry in October – my friend requested a batch of those when I offered to bake for her fall birthday. Despite making a list and checking it twice, my third trimester brain totally spaced out three crucial components when grocery shopping for the ingredients to make the original cookie recipe. I can’t say I’m mad at how these makeshift Cranberry Orange Cookies turned out! And in case you’re wondering, the birthday girl dubbed them “damn good” and confidently stated they have a “real bakery taste”. Her words, but I have to agree. The palm shortening in these AIP Cranberry Orange Cookies is what gives them their height and fluffy texture, while the beef tallow adds a level of richness. Beef tallow is high in healing omega 3s, while the palm shortening is a type of saturated fat is similar to coconut oil. Which means these cookies help to promote energy production and a healthy metabolism… Well, that’s my story and I’m stickin’ to it ;). In this recipe, the gelatin acts as a replacement for gluten. Gelatin, like gluten, acts as a glue to give these cookies stability. The benefits, vitamins, amino acids, and minerals of gelatin are almost identical to collagen peptides, but the differences lie in the application. 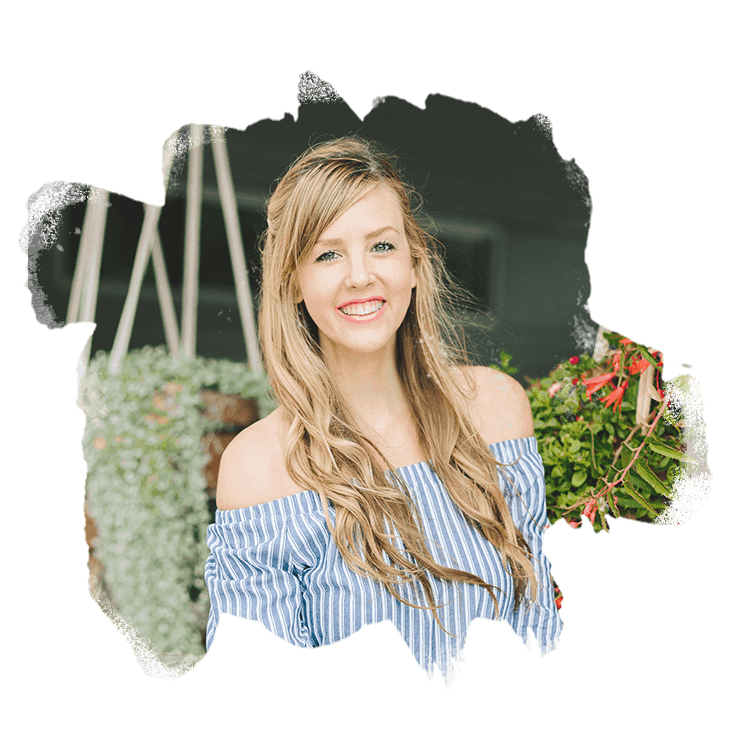 Hydrolyzed collagen is easier to mix into cold liquids and won’t gel up, while gelatin does just that, specifically when blended into hot drinks. These AIP cookies are relatively low in sugar. At the most, they each have about 1 tsp of coconut sugar. This is only about 4 grams of carbs/sugars, and since it’s coconut sugar, it’s a low glycemic index sweetener with a flavor similar to traditional brown sugar. While they aren’t anywhere near as high in sugar as a traditional Cranberry Orange cookie, I do want to emphasize the importance of viewing these cookies as a treat and an indulgence. While they can fit into your healing journey without disruption, they shouldn’t included in your daily diet. Be sure to include any AIP desserts in your diet as an occasional treat so you can focus on more nutrient dense produce and proteins. 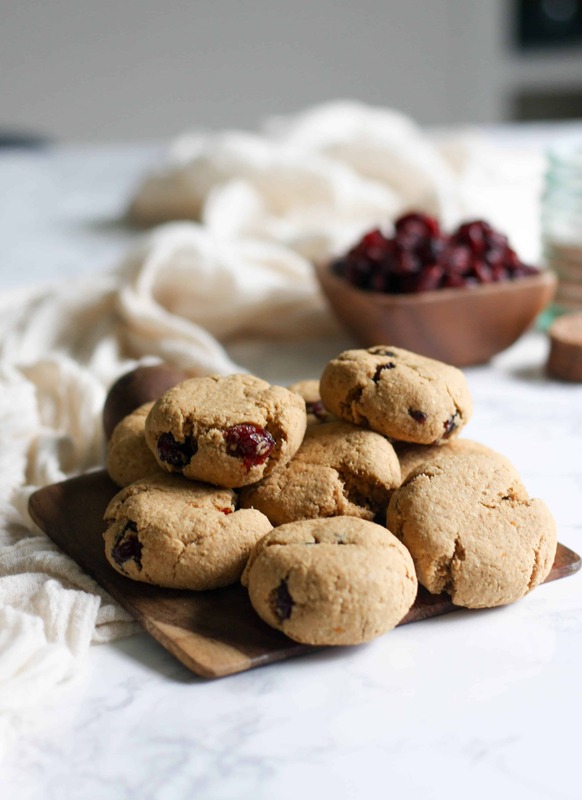 A buttery, slightly sweet, perfectly delicious Cranberry Orange Cookies made with simple ingredients and unrefined sugar. Totally crowd pleaser for your holiday cookie exchange. I may be biased. Pssst… speaking of cookie exchanges, I have a free holiday e-cookbook! Download your free copy right here. In a large bowl, combine ghee/tallow, shortening, xylitol (or additional coconut sugar), coconut sugar, orange juice and zest with a high hand mixer. In a second bowl, combine the coconut flour, arrowroot starch, gelatin, baking soda, cream of tartar, and vanilla. Slowly add the flour mixture to the wet ingredients until well combined. With a spatula, stir in the dried cranberries or cherries. Form into 16 cookies, and place on a parchment lined cookie sheet. Press down lightly on each cookie to flatten slightly. Bake for 10-12 minutes, and let cook on a wire cooling rack. So I’m thinking of trying this with fresh chopped cranberries. I don’t have beef tallow but I do have lard (not leaf), do you think the flavor will be okay? I think fresh chopped cranberries would be great! 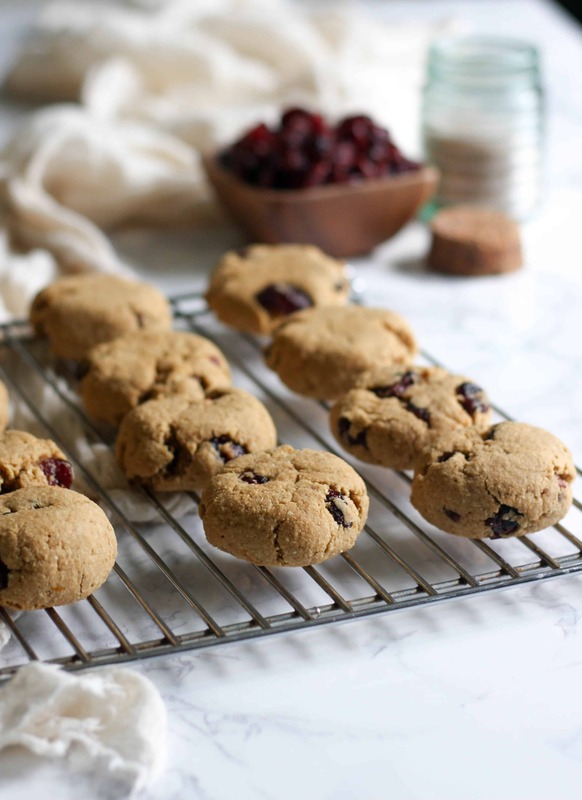 I’ve had more luck finding dried cherries without any seed oils, and they’re delicious in these cookies. So you could also try those! I’m also not sure about the lard, but I would assume it would work well! The tallow provides a rich flavor. I think lard might do the same.